John Duffy says that his biggest challenge over the coming weeks will be to keep his players motivated. Rovers are already guaranteed a spot in the Championship Shield final due to a change in structure from last year’s competition. The top two automatically earn a place in the final, with first place hosting second place. 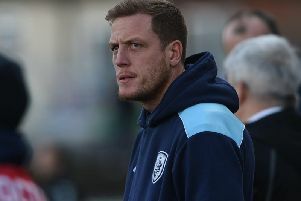 And with Leigh Centurions and Rovers streets ahead of the rest the competition, the Featherstone boss admits staying motivated could be a challenge. “It is yeah,” confessed Duffy when asked if it is a struggle to keep his players motivated. “There are 20-odd blokes there and we knew what would happen if we didn’t make the four. “They are a good group, a really good group – they are the best group I have been involved with. “We have all been upset over the last couple of weeks about not making that four. The former Swinton Lions chief praised his players after their 26-12 win over Batley on Sunday afternoon as for large parts of the game his team only had 14 fit players. He said: “I had to put Jason Walton at prop and he was unbelievable, they couldn’t really handle him down the middle. “Luke Briscoe played centre, then we had to swap him to full-back when Ian Hardman came off. “So I am really proud of the lads, a lot of them had to play in different positions today.